This year's search for a Christmas tree has taken an economic twist. Seems the price of trees has followed the rise of gasoline prices (and everything else). It must be the water used to maintain them during the year is costing more, or there's some new expensive fertilizer the tree farm association members are using that help the trees grow, or perhaps there's a new laser device or computer program that sends signals to the trees to aid them in maintaining their lush appearance, which in turn makes them more valuable. I know that the trees that we'll look at to cut were planted a few years ago, so the tree itself wasn't replaced by a more expensive model, and I happen to know that you can get 100 starter trees for practically nothing so, once again, must be something else! Oh well, in the past I've had some experiences picking a tree and cutting one down (and I'll share some of those stories as the holiday approaches), but this is the first time I'm scouting for a tree, prior to our traditional tromp through the snow (hopefully, it's snow...several times it's been mud and that's not pleasant). We saw an advertisement for a local tree farm from which we've chosen our tree for the past few years and the price went up about $15.00 from last year. So, my wife told me that 'we' needed to start looking for a cheaper tree. The 'we' part? Means me. We live in the country, you know not near any sidewalks (sigh!!! ), so there are a number of farms, tree and otherwise, around us. Armed with instructions to find a cheaper tree, I sent emails to a few, called a few, contacted a number of friends, and even drove way out on a country road that led to a farm where we cut trees 20 years ago to find that it's out of business, even though it's still advertised in our local Christmas Tree business directory. After conferring with local experts (those other persons who look for trees and those who grow trees), here's what I found, and let me know if you think this makes sense. 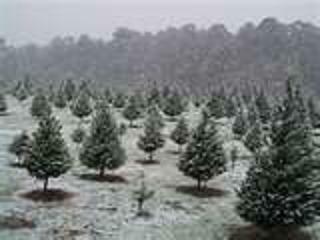 If you pick up one of the trees that the Christmas Tree farm personnel have cut and dragged to the shed, which they'll wrap and place on your car, you can get a tree for about $25.00. 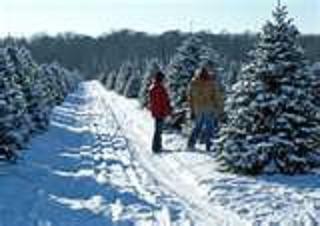 However, if you trudge through the snow, up and down the hills for hours on end to find the 'perfect' tree, cut it down, and drag it back yourself, you'll pay $45.00 or more! Why the extra cost for a do-it-yourself? I'm thinking it's the experience (a.k.a. liability insurance). Doesn't make sense that the ingredients would cost more than a store bought cake. Does make sense that if you experience a tree saw cut to a body part, while doing the deed yourself, that the farm owner might incur an expense. Although, if you can now only count to nine that might limit your ability to come up with the total you're looking for. Doesn't make sense that water, malt, yeast, and hops to make a keg of beer would cost more than a full one at the discount store. Does make sense that the experience of getting caught in the mechanism that wraps the netting around the tree to encapsulate it so you can toss it on your car might become an expensive proposition for the tree vendor. Although, there would be more seating room in the car and the 'netted' person would have quite the ride home atop the car! I did load a tree on a skid one year and, heading down a very steep hill with it, the whole thing took off quickly and I had a heck of a time keeping up with it. I was nearly out of breath when I caught up with it at the bottom of the hill. I can look back at that experience and guess I would have had the same sense of exhilaration coming off Space Mountain at Disney! If I look at it that way, as in pure entertainment and exercise value, seems it's worth the extra bucks! Well, we're going to find a tree and pay a reasonable price for it. The fact that I've all ready put about $200.00 towards this effort, in time spent on the phone and on the computer determining prices and the amount of gas I used getting lost on the back roads searching for the Tree Farm of Christmas Past, does not diminish our goal of not handing over any more than we want to for our Christmas tree this year! More to come regarding this quest, I'm sure!